walnuts recipes | Indian Akhrot recipes. Walnuts are a delicious way to add extra nutrition, flavor and crunch to a meal. It is a great source of those all-important omega-3 fatty acids. Walnuts (Akhrot) : Eating a handful of Walnuts a day is said to increase the good cholesterol (HDL). Walnuts are rich in Omega 3 Fatty Acids which contain high amounts of DHA which improve thinking power in adults and excellent for brain health for newborn kids. Being a good source of Folate, Vitamin B9, it’s good for pregnant women to top up their folic acid with eating a bit of walnuts daily. As it's low in the Glycemic Index, and loaded with Fibre, it’s a good choice for Diabetics. See detailed benefits of walnuts. 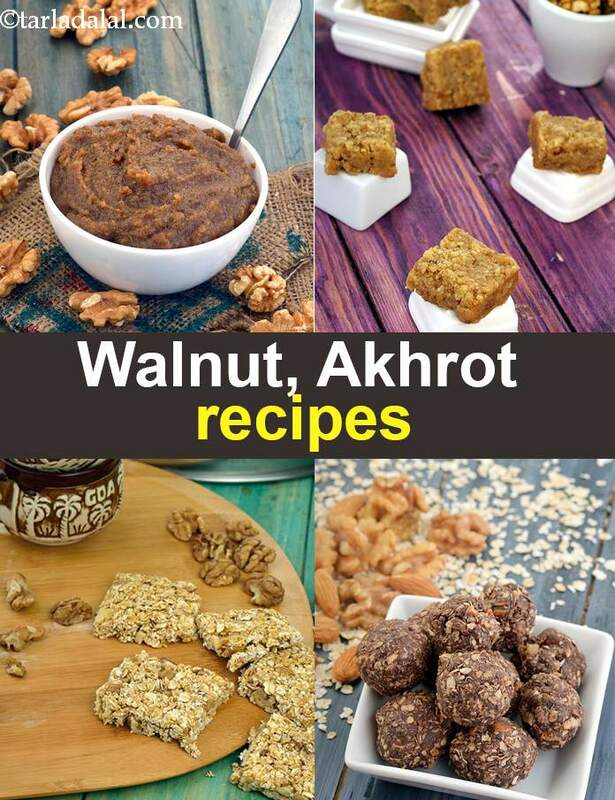 Enjoy our walnuts recipes | Indian Akhrot recipes below. Hara bhara kebab, a green delight loaded with nutrients from paneer, spinach, chana dal and green peas. Pack this all time favourite snack with green chutney or tomato ketchup and await an empty tiffin back home.